Up to 64% of American adults are considered either overweight or obese. As women approach menopause they experience many symptoms, including menopausal weight gain. While it is one of the more frustrating symptoms of menopause, it is also one of the most common. In fact, up to 90% of menopausal women will experience weight gain to some degree. Although weight gain is a natural and common aspect of getting older, there are ways to reduce it. By better understanding why it occurs during menopause, women can work to prevent menopausal weight gain. Continue reading to learn more about weight gain, its causes, and treatment options. Weight gain takes place when body mass increases, whether as a result of fat deposits, additional muscle tissue, or excess fluid. However, weight gain associated with menopause typically increases fat around the abdomen. On average, women gain between 12 and 15 pounds between the ages of 45 and 55, when menopause typically occurs. This extra weight generally does not evenly distribute itself throughout a woman's body, but instead accumulates around the abdomen. Read below to learn the common symptoms associated with weight gain during menopause. Women generally know when they have gained weight and do not need to learn how to identify this menopause symptom. Some of the indicators, however, are unique to weight gain associated with menopause. At the right is a list of symptoms of weight gain during menopause. Women who gain in excess of 20 pounds after menopause increase their breast cancer risk by nearly 20%, but those who lose 20 pounds after menopause reduce their breast cancer risk by as much as 23%. 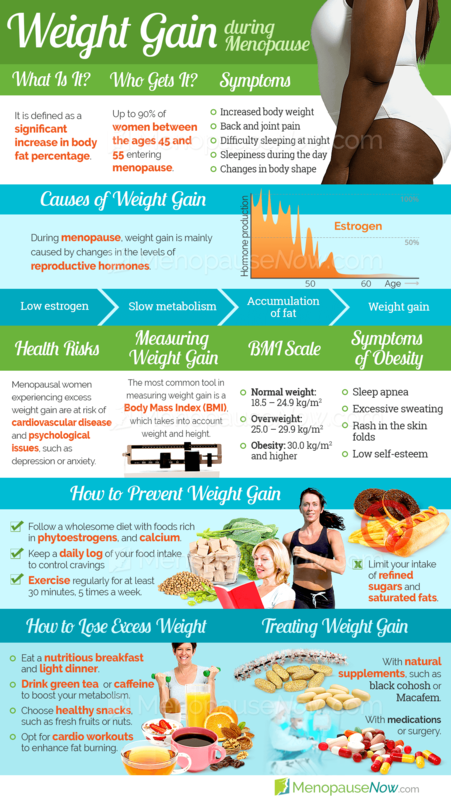 Click on the following link to learn more about weight gain, or continue reading below to learn what causes weight gain during menopause. Menopausal weight gain can be extremely frustrating. It can be harder to lose weight, and with all of your other challenges during this transition, you may not want to commit to a strict regimen. Luckily, there are fun and easy changes you can implement for a healthier lifestyle. Read on to learn more. Weight gain is often reported as a symptom of menopause and, if it is not dealt with, can have serious effects on health. The causes are numerous and so it is important to be aware of possible personal triggers. This article is a guide to menopausal weight gain. As the years progress, metabolism slows, setting the physiological stage for weight gain. Although age itself can lead to weight gain, women approaching menopause have particular cause for concern. As a woman's hormone levels fluctuate prior to menopause in preparation for the end of menstruation, they are likely to experience weight gain. A drop in estrogen and progesterone can increase a woman's appetite and cause her to eat up to 67% more, according to one study. An increase in appetite coupled with a slower metabolism with the onset of menopause can cause weight gain in women. This could, perhaps, account for the 12% jump in the number of women who are overweight during midlife compared to women in their 20's and 30's. As a woman's ovaries produce less estrogen, her body attempts to draw from other sources of estrogen. Fat cells can produce estrogen, so her body works harder to convert calories into fat to increase estrogen levels. Unfortunately, fat cells do not burn calories the way muscle cells do, which causes weight gain. Water retention is often linked to menopause because water weight and bloating can result from a decrease in progesterone levels. Though this doesn't actually result in weight gain, clothes can feel a bit tighter and a woman may feel as though she's heavier. The amount of this hormone increases at the onset of menopause. It's responsible for redistributing weight to the midsection instead of to the hips. Women with an underactive thyroid often experience weight gain because their metabolic rate slows down as a result of the condition. In some cases, hyperthyroidism can also cause weight gain, but that is rare. Thyroid hormones essentially regulate calorie consumption in the body. With an underactive thyroid, fewer calories are burned and converted into energy. Instead, they are stored in the body. Beginning at about age 30, an individual's physical abilities begin to decrease and continue deteriorating until about age 60 or 70. The body's abilities then level off and decline at a slower rate. The rate of decline depends largely on an individual's physical activity and particular lifestyle. This decreasing physical ability affects weight because a person becomes less able to engage in physical activities that help to maintain a stable weight by burning calories. To compound the potential for weight gain with age, the metabolic rate begins to slow after age 30, which also leads to weight gain. Click on the following link to learn more about the causes of weight gain during menopause, or continue reading below to find out some of the best treatment options for weight gain associated with menopause. Many people trying to adopt a healthy diet pay a lot of attention to the foods that cause weight gain, but drinks are often forgotten. Many of them, however, are highly calorific, and if care is not taken to reduce intake of certain beverages, weight can still increase, regardless of diet. The link between smoking and weight gain is hazy, and there is often contradictory advice, meaning people are divided in opinion. This article examines the evidence available in order to determine what the link between smoking and weight gain really is, and whether smoking is the cause of piling on the pounds. Drinking excessive amounts of fat-loaded coffee is directly linked to weight gain. Many of the popular coffee drinks in America are packed with calories, fat, and sugar. It is important to avoid or moderate these drinks. The general recommendation is one to two cups of brewed coffee per day. When looking for treatments for weight gain, it's important to begin with methods that are the least obtrusive, with the least likelihood of side effects, and progress from there. Most women experience a 5% decrease in metabolic rate per decade. Because metabolism slows as women approach menopause, they need about 200 fewer calories a day to maintain their weight as they enter their mid to late 40s. This means that lifestyle changes are the best place to begin. The tried and true way to cope with weight gain is to exercise regularly and eat a healthy, balanced diet, practicing moderation. Typically, combining lifestyle changes and alternative medicines will produce the best results. When seeking out alternative medicines, keep in mind that because weight gain during menopause is associated with hormonal imbalance, so look for herbal supplements that bring a natural balance to hormonal levels, as this will go a long way toward curbing weight gain at the source. Finally, if a woman is still experiencing weight gain, there are different prescription medications and surgeries she can explore, such as diet pills or bariatric procedures. This final option comes with the most risk and side effects and should be considered a last resort. A healthcare professional should be consulted before undergoing one of these options. Click on the following link to learn all the specifics about treatments for weight gain during menopause, which begin with lifestyle changes, move onto alternative medicines, and finally, if those options don't seem to help, medications and surgery. Weight gain around the abdomen, which is the most common type of weight gain during menopause, is associated with heart disease and diabetes. This means that losing weight during menopause is not just an aesthetic choice, but one that can also significantly improve your health. Diet plans that promise a quick, easy way to lose weight are very rarely effective, especially in the long term. Beware of any weight loss program that depends on diet pills or eating only prepackaged foods or drinks. The best way to lose weight is to focus on healthy eating and healthy activity. 08/27/2018 Losing weight throughout the various reproductive stages doesn't have to be difficult. It is important for women to consume whole foods high in fiber and protein as well as those scientifically proven to support weight loss efforts. Keep reading to learn more about top foods that burn fat here. 04/19/2016 Thyroid problems - specifically an underactive thyroid (hypothyroidism) - can cause weight gain. Thyroid problems typically develop over years and become apparent during menopause because of the hormone fluctuations experienced during this time. It is important to seek medical treatment, as symptoms can worsen if left untreated. 03/08/2016 Many women complain of weight gain after a hysterectomy, or think it is an inevitable consequence of the operation. However, there is little evidence to show the link between the two, and studies have actually shown that the weight gain many women experience after a hysterectomy is down to much more controllable factors. 02/18/2016 Weight gain tends to increase and metabolism slow as a woman approaches menopause, and many people can find this distressing. This article gives more information about why weight gain is such a common symptom of menopause and what risks are involved if it is left untreated.